There are four price options depending on what you are looking to gain from a personal trainer: one-off sessions, or bundles of 5, 10 and 15 sessions. Each option is on a per person basis and your first consultation is 100% free so you have nothing to lose, give me a call today! One-offs are suitable for people who either want occasional support and advice on exercise regimes on a sporadic basis, or those to want to trial the concept of a personal trainer before committing to multiple sessions. The bundles are better value if you know you want several sessions on a regular basis, for instance at the start of a new exercise plan or if you feel you need additional motivation. The sessions do not need to be taken at regular intervals, or within the same time slot each time, although this is how most people prefer to work. Please note that if you are not opting for a regular periodic session then I will need sufficient notice of the day and time when you would like to book a slot, and I cannot guarantee being able to accommodate every request. I will advise you of your optimal eating and workout routines but it is up to you as the trainer to take onboard the fitness and exercise information from Female Personal Trainer Derby to achieve your keep-fit goals. It will require alot of motivation and commitment but I will be here for you every step of the way to make sure you release your full potential. I wasn’t sure if a personal trainer would be worth the money, but Cherie has more than justified every penny. She’s always been on hand to help me and keep me on track when my resolve – and energy – have wavered, and now I wouldn’t be without her! So friendly and easy to talk to, she didn’t make me feel awkward even though it’s been years since I did any regular exercise. She started me off with exercises I could do and then as I got fitter and more flexible she adapted my workouts to push me even further – but never too far. Now I’m far happier with myself and have a healthy attitude to food and fitness. Professional and very knowledgeable. I liked the fact she only works with women so the advice she gives is realistic and relatable. Have had a few sessions now and am so glad I opted for a PT, I’ve achieved far more with Cherie than I ever did on my own. Each session is one hour long, including warm up and cool down activities. This is the ideal length for a workout as you can sustain moderate- to higher-intensity exercises for at least 30 minutes. 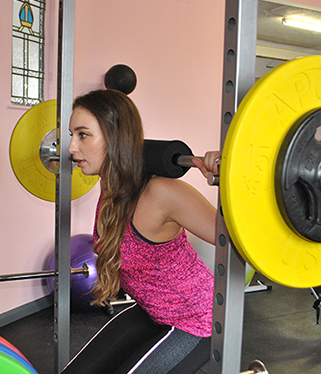 What does a personal training session involve? Initial meetings will involve testing your current fitness levels, and devising an exercise plan that matches both your current ability and your goal. Further sessions will be spent ensuring you complete the exercise plan to the best of your ability and pushing you to improve on your previous performances. Most of the exercises I recommend are possible at home, without the need for specialised equipment. Occasionally I may recommend an activity which requires props, such as weights or an exercise mat – these are recommendations only, and it is down to you as the individual to decide if you want, or are able, to purchase the suggested equipment. Conversely, if you already own several items of fitness equipment and would like advice and training on how to use them, or would like me to incorporate them into your regime, then I can do so. Can I invite a friend to exercise with me? Exercise is often more enjoyable with someone else there, so I am happy to run sessions for more than one person simultaneously. However, please bear in mind that the prices above are per person, not per session; therefore training with one other person is £20 an hour each and with three people is £15 each. Can I book the same day and time every week for my session? Yes, this is fine and in fact is positively encouraged – both to aid you in knowing when and where your next session will be, and also to help me manage the different clients I have. You can also book sessions on a fortnightly or monthly basis. If you find you cannot make a session, please contact me as soon as possible and I will do my best to rearrange for another time to suit you. However, please bear in mind that for last-minute cancellations, it may be difficult to reschedule a time slot in the immediate future. I know I want a personal trainer for more than 15 sessions. Is it possible to book more in advance? At the moment we only offer a maximum of 15 advanced booking sessions; however, if you know that you want a personal trainer on a longer-term basis then please discuss this with me at your first meeting to find a suitable payment plan. I currently accept cash upon arrival, personal cheques, Paypal transfers and Contactless payments at the time of the session. If you intend to maintain personal training sessions for a long period of time you may be able to set up a standing order to pay for your sessions on a weekly or monthly basis. I do not accept Banker’s Drafts or bank transfers at this time. How long is a bundle valid for? Once you’ve bought your bundle, it’s up to you where and when you ‘spend’ it. For those with regular appointments, this isn’t an issue – but for those who want more sporadic support, then you have 12 months in whichc to use any remaining sessions. I currently do not have a refund policy for anyone taking out a bundle and later deciding it’s not for them. It is with this in mind that I offer the one-off ‘taster’ sessions. However, if you cancel a session with reasonable notice, I will endeavour to rearrange the session at another convenient time at no extra cost. If you sustain an injury during the time you are due to be attenging training sessions, then you will have the option to postpone your sessions until health is restored, or to claim a refund on the remaining unused sessions; however, any refund is at the discretion of myself, dependent on circumstance. I cover all of Derby itself, as well as several outlying towns and villages. If you’re unsure if I operate within your area, then please get in touch and I’ll be happy to discuss location eligibility with you.